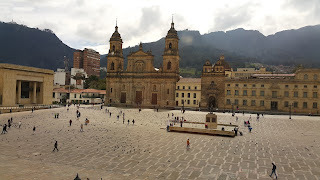 If you come to Bogotá, Colombia, you will find a vibrant city that is, for sure, going to surprise you. And it is said, because this metropolis lived by more than 9 million people is a place on earth you would like to know if you are interested in history and want to see how this elevated location, up on the Andes mountains, is one of the most important and modern developed cities of the Americas. The Muiscas, were the natives that lived here before the Spaniard conquistadores, came to this extended plain. They had a very good life over here; the salt mines of Zipaquira, and a very fertile land, made this a hot trading place, where other tribes came to exchange products for the salt and the produce. The payment for the commodity could be fish or hunt, or tropical fruits and vegetables, but also they paid for it in the form of gold artifacts.